1 A None No Power Seat 1 A has restricted legroom due to the positioning of the bulkhead. The tray table is in the armrest, making the armrest immovable and slightly reducing seat width. There is no floor storage during takeoff and landing. This seat has a misaligned window. Delta designates this seat as a Preferred Seat, which is reserved for Delta Medallion members. This seat may be selected by Medallion members at time of booking or afterwards. This seat becomes available to all passengers at time of check-in. 1 B None No Power Seat 1 B has restricted legroom due to the positioning of the bulkhead. The tray table is in the armrest, making the armrest immovable and slightly reducing seat width. There is no floor storage during takeoff and landing. This seat has a misaligned window. Delta designates this seat as a Preferred Seat, which is reserved for Delta Medallion members. This seat may be selected by Medallion members at time of booking or afterwards. This seat becomes available to all passengers at time of check-in. 1 C None No Power Seat 1 C has restricted legroom due to the positioning of the bulkhead. The tray table is in the armrest, making the armrest immovable and slightly reducing seat width. There is no floor storage during takeoff and landing. This seat has a misaligned window. Delta designates this seat as a Preferred Seat, which is reserved for Delta Medallion members. This seat may be selected by Medallion members at time of booking or afterwards. This seat becomes available to all passengers at time of check-in. 1 D None No Power Seat 1 D has restricted legroom due to the positioning of the bulkhead. The tray table is in the armrest, making the armrest immovable and slightly reducing seat width. There is no floor storage during takeoff and landing. This seat has a misaligned window. Delta designates this seat as a Preferred Seat, which is reserved for Delta Medallion members. This seat may be selected by Medallion members at time of booking or afterwards. This seat becomes available to all passengers at time of check-in. 12 A None No Power Seat 12 A is a standard Economy Class seat however the proximity to the lavatory may be bothersome. 12 B None No Power Seat 12 B is a standard Economy Class seat however the proximity to the lavatory may be bothersome. 12 C None No Power Seat 12 C is in the last row of the plane. This seat has limited or no recline and the proximity to the lavatory may be bothersome. 12 D None No Power Seat 12 D is in the last row of the plane. This seat has limited or no recline and the proximity to the lavatory may be bothersome. 13 A None No Power Seat 13 A is in the last row of the plane. This seat has limited or no recline and the proximity to the lavatory may be bothersome. 13 B None No Power Seat 13 B is in the last row of the plane. This seat has limited or no recline and the proximity to the lavatory may be bothersome. 2 A None No Power Seat 2 A is a standard Economy Class seat. Delta designates this seat as a Preferred Seat, which is reserved for Delta Medallion members. This seat may be selected by Medallion members at time of booking or afterwards. This seat becomes available to all passengers at time of check-in. 2 B None No Power Seat 2 B is a standard Economy Class seat. Delta designates this seat as a Preferred Seat, which is reserved for Delta Medallion members. This seat may be selected by Medallion members at time of booking or afterwards. This seat becomes available to all passengers at time of check-in. 2 C None No Power Seat 2 C is a standard Economy Class seat. Delta designates this seat as a Preferred Seat, which is reserved for Delta Medallion members. This seat may be selected by Medallion members at time of booking or afterwards. This seat becomes available to all passengers at time of check-in. 2 D None No Power Seat 2 D is a standard Economy Class seat. Delta designates this seat as a Preferred Seat, which is reserved for Delta Medallion members. This seat may be selected by Medallion members at time of booking or afterwards. This seat becomes available to all passengers at time of check-in. 8 A None No Power Seat 8 A is positioned in the exit row but it does not offer extra legroom since it has the same pitch as the other seats in the plane. The exit door may protrude into your space, which may be bothersome. Delta designates this seat as a Preferred Seat, which is reserved for Delta Medallion members. This seat may be selected by Medallion members at time of booking or afterwards. This seat becomes available to all passengers at time of check-in. 8 B None No Power Seat 8 B is positioned in the exit row but it does not offer extra legroom since it has the same pitch as the other seats in the plane. Delta designates this seat as a Preferred Seat, which is reserved for Delta Medallion members. This seat may be selected by Medallion members at time of booking or afterwards. This seat becomes available to all passengers at time of check-in. 8 C None No Power Seat 8 C is positioned in the exit row but it does not offer extra legroom since it has the same pitch as the other seats in the plane. Delta designates this seat as a Preferred Seat, which is reserved for Delta Medallion members. This seat may be selected by Medallion members at time of booking or afterwards. This seat becomes available to all passengers at time of check-in. 8 D None No Power Seat 8 D is positioned in the exit row but it does not offer extra legroom since it has the same pitch as the other seats in the plane. The exit door may protrude into your space, which may be bothersome. Delta designates this seat as a Preferred Seat, which is reserved for Delta Medallion members. This seat may be selected by Medallion members at time of booking or afterwards. This seat becomes available to all passengers at time of check-in. Non-alcoholic beverages are complimentary. Beer, wine, and a variety of spirits may be purchased in Economy. Additional information is available in the "Travel Info / Onboard Experience" section on delta.com. This aircraft has limited inflight services aboard and is used for short-haul regional routes. The exit row seats do have more leg room than a standard seat. The window exit row seats do not have an arm rest against the window. This is supposed to be a "Comfort Class" seat. As others have said, it is anything BUT comfortable. Tiny, hard, narrow seat with a very low window and no usable overhead space. The very small carry-on I use for these commuter flights didn't fit in this plane, so I ended up having to remove items and gate-check the bag. If you have ANY option to fly another plane, please do so. Avoid this plane if you can- my flight was only 50 minutes, but adding in the boarding and taxi time made it about two hours, and a day later my back is still hurting from being crammed into this ridiculous aircraft. If they would take some seats out and make this a 30 seater, it MIGHT be tolerable, but putting 50 seats into a plane this size is cynical at best. I will do everything I can to avoid this aircraft for future travel. If your 5 ft 11 in or taller do not take this plane unless you have really short legs. My wife and I got Seats 13A&B while flying standby several years ago. Our original flight left before we got to SLC, due to deicing and maintenance issues. We got the last open seats on the jet. They were cramped, noisy, and looking out the window gave me a sore neck!!! Nevertheless, we were glad to be getting to our destination at a reasonable hour!!! SkyWest, Comair, ASA, etc please retire these jets ASAP!!! Not a good seat, but at least you can lean into the aisle as nobody is going by, until after the service cart is finished and a few people use the bathroom. It's usually a short flight so I didn't think it was a big deal, but then again I was just happy to make an earlier connecting flight and save 3 hours of downtime in ATL. This plane is quite small, so no one has great leg room, but I found 1A/1B to be roomier than the other rows. As noted, there is no floor storage, so the FA stored my bag for me overhead. The tray (stored in the armrest) was about half the size of a typical economy tray. This plane is very small. I'm 6'0 and I hit my head on the overhead compartments, which are too small to fit most carry on bags, which have to be valeted. no wifi or power on these planes. However there is complementary drink and snack service. Wow, this plane is cramped. Now, I actually like the CRJ700 and love the CRJ900...but this one? Dang, better hope your neighbor showered. Tight seat pitch, really narrow shoulder space, no matter where you sit. 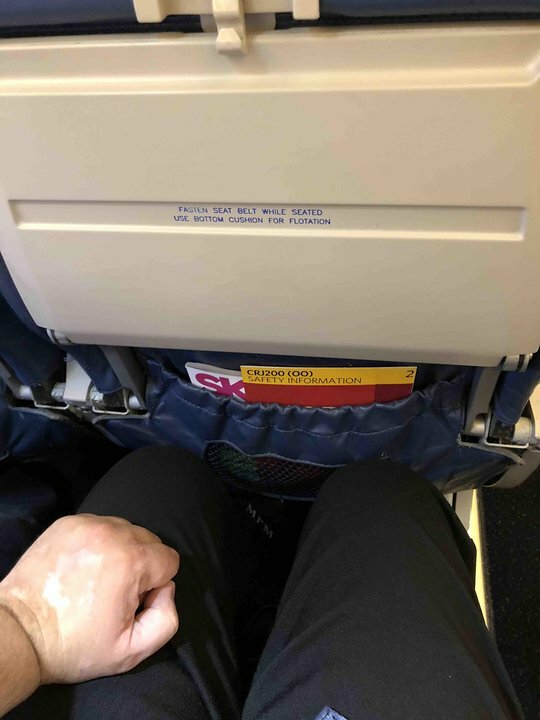 I'm 5'10" and 235lb-ish...and have had to spend an entire flight hunched against the wall, while my linebacker-neighbor had to lean out into the aisle. Luckily, this plane is used for blessedly-short hops from my local airport to the hub about 100miles away. I can confirm no recline. Also my carry-on which has always fit in the overhead would not on this plane, however it did fit under the seat, it usually does not fit under the seat. Flying Delta Connection out of my hometown 'regional' airport means I'm always on a CRJ-200 for at least the first and last legs of any trip. I'm 5'10/235. All smaller, regional planes are a challenge for just about everyone (narrower seats, fuselage that curves into your head space for window seats, VERY limited overhead bin space, narrow main aisle to the lav at the back, etc. ), and maybe I'm just accustomed to it after scores of flights per year, over nearly ten years, but I really have no complaints at all about this plane. I have far more issues with some 'big-city' FAs' attitudes than the metal we're flying on. Since I choose to live 90 minutes by air from a DAL Hub (and 35 min by ground from a UAL hub!) I'm happy to have the 'regional'-size plane service available, instead of having to Cry the Grumbly Fries of the Star Alliance on every freakin flight. Honestly, this seat's legroom is incredible on Expressjet operated flights. Tons of space, cold but what you would expect from a exit row seat. No overhead space, as it is dedicated to emergency equipment. Row 7 seats (in front of the emergency exit row) do not recline. 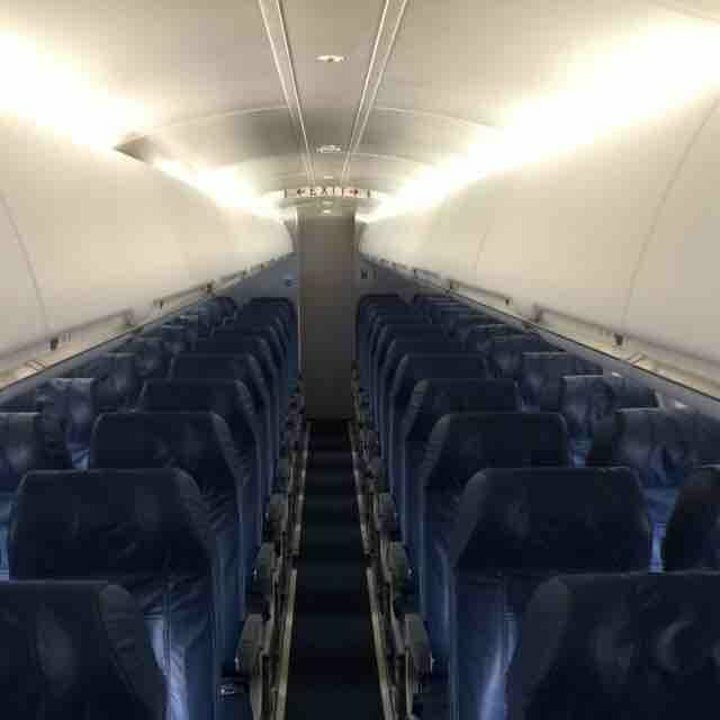 Neither to the seats in the last row of the aircraft (rows 12 & 13). The first row is up against the bulkhead and has limited legroom and no under-seat stowage. What everyone else has said about this plane is spot-on. It's tiny, it's cramped, the windows are too low and it's noisy. Airlines like it because it's economical, but honestly, I enjoyed my flight on a USAir Dash-8 better than I did on this one. I "affectionately" call this plan a "flying sardine can" as you are crammed/packed into this tiny 50-seat plane. As someone who has flown on many flights on this aircraft and who has sat just about everywhere, I can state that there is not one comfortable seat on this class of aircraft if you're over 5'8", 200 pounds, or have broad shoulders (I fit all 3 categories). If you can't avoid this plane, I feel for you and I suggest an aisle seat. All of the seats on this plane should be red. Avoid if you get freaked out by cramped, small places. I'm 5'3 and I hit my head on the overhead bins every time I stood up. I had to bend over in my seat to look out the window because they are so low. This seat did have a nice view of the wing. The foam in the seat cushions needs to be replaced. I could feel the seat's frame under me. I have sat on more comfortable stone park benches. Windows are too low. While they're OK for looking down at the ground while in flight, good luck looking at anything around the airport during taxiing, etc. Probably just right if one is 5'0", which I am not. The only nice thing I have to say is that you can gate check your bag on these flights and avoid the carousel wait and extra damage inevitably inflicted by the baggage handlers. I am on a delta crj200 and 1b and 1c are easily the best seats in the house. Yes there is the bulkhead but you only get half of it in b and c. Also there is definitely more leg room. Ill post a photo. Im 6'4" so know and appreciate. This whole plane is god awfully cramped. I'm 6'5" so I always pick the isle so only one of my knees is jammed into the hard seat in front of me. Avoid the CRJ-200/100 AT ALL COSTS! 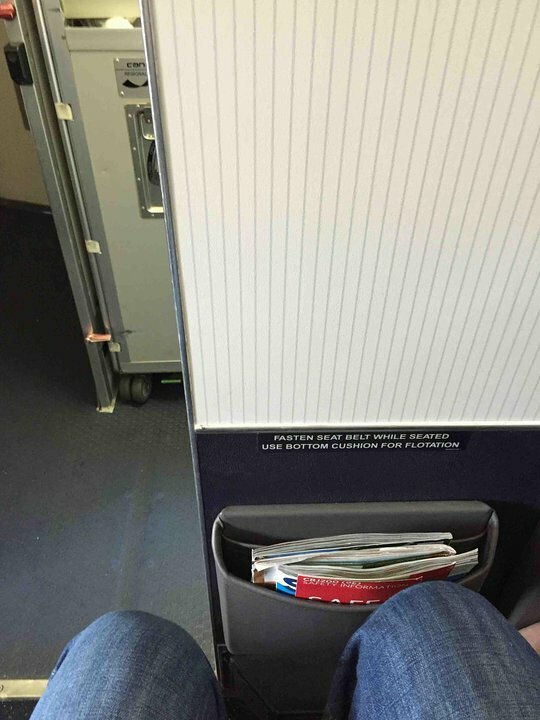 I sat in 1 c, which is the bulkhead, and although the flight was full or almost full no one was next to me. I looked at the lack of legroom people had in the rows behind me and the fact that the seats do recline and I was really glad that I chose an aisle bulkhead seat. I could stretch my leg out into the galley area when the FA was busy serving drinks and was not in that area. Although there is probably no comfortable seat on this plane, if you are at all claustrophobic, I would recommend a bulkhead aisle seat. I am 5'11" and 190# guy. 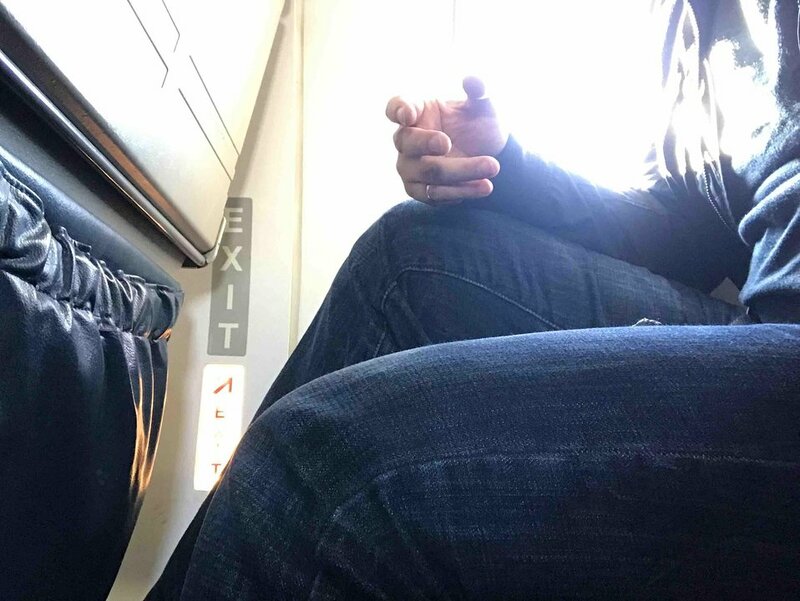 The lack of indentation at the exit row in addition to the lack of extra legroom typical in exit rows made this an extremely uncomfortable 2 hr flight for a 6'4 210 lb man. My shoulders barely fit in the seat due to the exit door. CRJ-200 Seat 9D (and I think 9A) don't have an indentation between ribs in the plane, taking away about 2" of shoulder space. On a plane this cramped that was a problem. I doubt there is a comfortable seat on this aircraft for someone like me 5-11 235 lb. My flight was full and even though it was not warm outside the heat was very uncomfortable. Not enough air. An hour was all I could take. More than 2 hours would make me crazy. It almost seems like this plane is exclusively for RST. It is quite a decent plane for the 20 min hop to MSP. The seat felt crowded and noise level was not very good by the lavatory. Although it was a good window & engine view for a short flight. I flew on this aircraft on a hop from MSP to YYZ. The aisle seat 11C was suprisingly comfortable. Even a touch more legroom than the 757 I had just flew on. That said, I would not want to be in a window seat on this aircraft. The side of your body sort of has to mould with the curve of the fuselage. I recommend an aisle seat. Entire first row is awful. Not only do you have no floor space for your belongings, the overhead bins above these seats are also unavailable because they contain flight gear. I do not believe there is any airplane being used by commercial airlines today that is less comfortable than this airplane. Despite being told by Delta two years ago that they were going to phase out the use of these planes, they continue to be used. Avoid these planes at any cost. I continue to be forced to use them at times because Delta has chosen to use them in and out of Madison for many of their flights. This is the number one thing that makes me consider switching away from Delta as my airline of choice (I am >2 Million miles and Diamond). 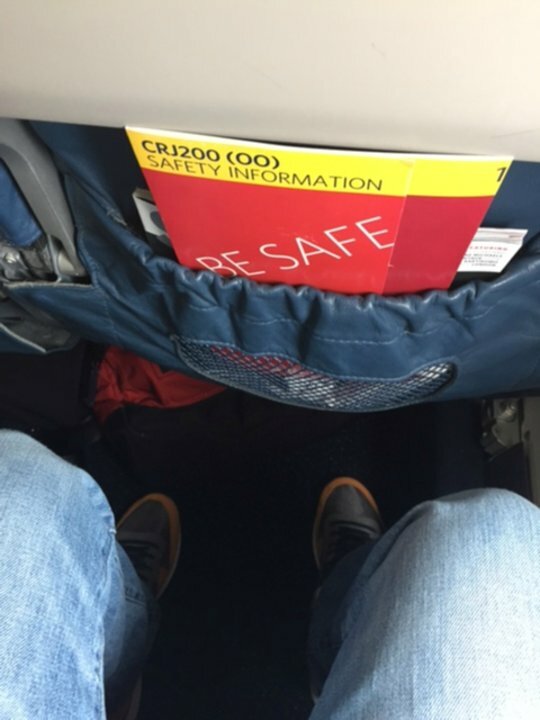 The entire first row on the CRJ-200 has almost no legroom due to the bulkhead being VERY close to the seats. The rest of the seats on the plane are already very cramped, but the first row is even worse. This plane has the least legroom in the first row for any plane that I've been on so far. Throw in a 3 hour tarmac delay on a 2 hour flight and this becomes 5 hours of hell. ALL seats on this plane are uncomfortable, and the air conditioning on my flight was non-existent, making it nearly unbearable for a one hour flight. Delta flies 1 versions of Bombardier CRJ-100/200.